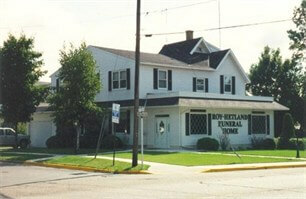 Welcome and thanks for visiting the Roy-Hetland Funeral Home website. We are proud to serve the Osakis community and surrounding area and understand the needs of a family experiencing a death. We will be here to help you with the many decisions needed to plan the service or memorial that best suits your family's needs. We are a family business and proud to have lived and served the families in the Osakis area for many years. You can trust us to understand and take care of all the details involved when a loved one dies. We are available to serve you any time - seven days a week, twenty-four hours a day. We are your Preneed Planning Specialists ! We represent PURPLE CROSS INSURANCE can help you pre-fund a funeral through our in-house insurance agent.